Weddings at the Nassau Inn are fulfilling for everyone - the Bride and Groom feel like royalty and guests are thrilled to have anything they want at their fingertips. The memories of your special day and your entire stay will have a beautiful backdrop with history no other venue can offer. Located in the heart of Princeton, we are walking distance from the train station, Princeton University, McCarter Theatre, and in the center of Palmer Square shops and restaurants. Click the link for fabulous promotions like 10% - 25% OFF ALL PACKAGES and A FREE PRIVATE CONTINENTAL BREAKFAST! At One Steep at a Thyme, we offer a full service Afternoon Tea on Saturdays and Sundays exclusively. Guests will enjoy a complete 7-course tea service during the 2-hours we will share as you relax and experience our gracious Victorian home. Seatings are by Reservation Only which ensures your time with us is our primary focus. Generally, two seatings are available most weekends at 12 noon and 3pm. Whether it is an intimate gathering with a close friend or a celebration milestone event with a group, the smallest details of your tea experience is important to us. Private Parties/Events are our specialty. We can customize your tea service options to make your gathering just perfect for you and your guests. May all your teas be…One Steep at a Thyme. Nestled in a bucolic setting overlooking 25 wooded acres, the Princeton Marriott at Forrestal is truly a unique destination. 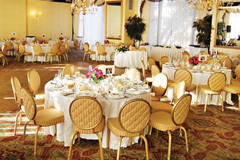 Conveniently located in Princeton, NJ, the Princeton Marriott at Forrestal is ideal for business or pleasure. Boasting 35,000 sq ft of meeting space, this IACC certified conference center offers state-of-the-art meeting facilities. The two ballrooms and outdoor terrace provide elegant backdrops for any wedding. Guests of the hotel can also indulge in our full service spa which offers facials, massages, body wraps, and salon treatments. Whatever your reason for travel, a refreshing and relaxing retreat awaits you at the Princeton Marriott at Forrestal. Like us on Facebook! Great gatherings at Princeton Meadow Event Center! Every day, people come together to share and learn, to network, to perform and to celebrate. You supply the event-we provide an elegant setting with exceptional service and food. Princeton Meadow Event Center is available for booking your Holiday Party. Week days and week-ends (Friday & Saturday) dates are available from November through December. Our Holiday Cocktail Menu - $37 per person. Three Hour Rental. Minimum of 40 & Maximum of 75 people. Dating back to the 1700's, The Rocky Hill Inn has been a cornerstone and integral part of the community of Rocky Hill. The Inn and Tavern features contemporary American food with French and Italian influences. Enjoy the cozy and romantic Tavern and Bar with over 17 draft beers on tap to choose from or warm yourself by one of the two fireplaces that grace the Rockingham dining room. Upstairs you’ll find two private dining rooms suitable for up to 40 guests to be or keep it small in the Turret room with seating for 5 – 8... Perfect for family celebrations or intimate business meetings. Chef Evan Blomgren has over 17 years experience at some of New Jersey’s finest restaurants and is a graduate of New York’s fames French Culinary Institute. Please go to our website for specials and view our live music lineup. Salt Creek Grille offers casual dining in a picture perfect location. Nestled in Princeton Forrestal Village on Rt. 1, the property combines craftsman style architecture with warm surroundings to create a casual elegance perfect for any gathering. In addition to the lounge & ala carte dining room, Salt Creek Grille offers two Private Dining rooms that boast state of the art audio visual technology, each with convenient access to our magnificent lawn and outdoor fireplace area. Groups from 20 to over 120 quests are offered a beautiful setting for any occasion, including rehearsal dinners, birthdays and anniversaries. The perfect location for a corporate seminar, meeting or company mixer. With personal and professional coordination of each event, we invite you to enjoy the fine food and gracious service provided by our private dining room staff! If you are ready to plan your special event, please call 609-419-4250 or e-mail tscheetz@saltcreekgrille.com. At the Wine Room of Cherry Hill, you will use small winery equipment, including authentic wine presses from Italy, to turn premium grapes into your very own exceptional vintage - regardless of your level of experience. We invite you to gather your friends, families and co-workers and join us for winemaking sessions where you will experience the fun and excitement of hand-crafting your very own wines from over 25 varieties of select California and Chilean grapes. After aging in oak barrels, you will bottle your wine with personalized labels so you can proudly share your vintage at casual gatherings or special occasions with guests, clients, or anyone who appreciates fine wine. California wines are made in the fall and Chilean wines in the spring. You will need to attend three to four winemaking sessions, with each session lasting one to two hours. Day, evening and weekend sessions are available. More info at www.thewineroom.com.